When the leaves start falling, it's time to get in that last mowing of your lawn and then put away the mower for the winter. Winterizing your mower will ensure it's ready for use when the grass gets tall again in the spring. 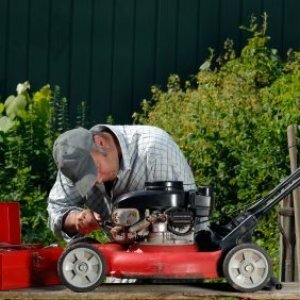 This is a guide about winterizing a gas-powered lawn mower. A well-maintained lawn mower starts effortlessly in the spring, runs cleaner, and helps make yard work just a little bit more enjoyable. Here is a basic overview of how to prepare your gas-powered lawn mower for winter storage. For the best results, make sure to follow the manufacturer's directions for the specific make and model of your lawn mower. Fuel doesn't stay fresh forever. If left standing for long periods, it turns stale, attracts condensation, and creates a gummy buildup on the inside of your carburetor. There are two schools of thought on what to do with leftover engine fuel during the winter. The first is to empty as much fuel from the gas tank as possible (using a siphon pump), and then run the mower until the rest of fuel is used. The second is to leave the fuel in the engine and add a stabilizer (to prevent deposits from forming), and then run the engine for 5 minutes to make sure the stabilizer reaches the carburetor. Both methods work, so it's really just a matter of what works best for you. If you store your mower in a dry, heated building or basement, you may want to empty the engine of fuel. 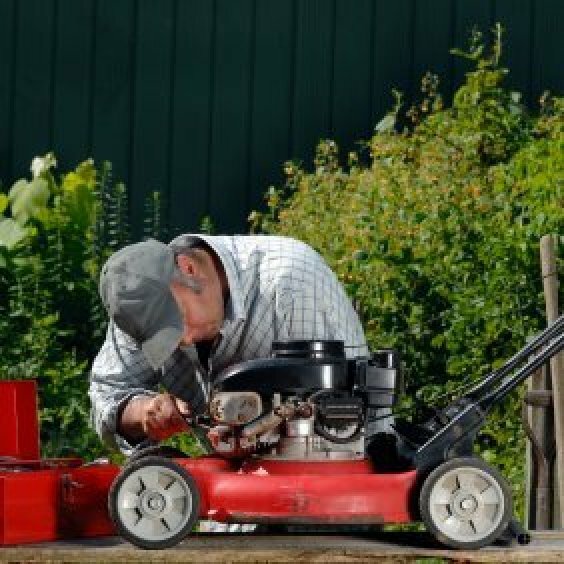 If you store your mower in a cold shed or unheated garage, consider leaving the fuel in the gas tank, but adding a stabilizer. While the engine is warm, drain and replace the oil. Be sure to use the type of oil recommended for your lawnmower. Too much oil is as bad for an engine as too little, so make sure to fill the oil reservoir to the mark displayed on the dipstick. Dispose of used oil properly by dropping is off at a local recycling center or service station. If you own a two-cycle lawn mower, one that mixes the oil and gas together, you don't have to worry about this step. Remove the spark plugs to check for corrosion, and either clean them or replace them. Remove the air filter and knock off any loose dirt. If it's really dirty, you may want to replace it. Check, and if needed, tighten up any nuts, bolts, and screws that might have become loose during the mowing season. If your lawn mower has a battery-powered starter, make sure it's fully charged before storing it for the winter. Mower engines do not fully recharge their batteries when operating, so in very cold climates, additional charging may be necessary during the winter in order to get a quick start-up in the spring. After the final mow of the season, spray off your lawn mower with the garden hose and wipe it dry. Clean the underside of the mower deck thoroughly before storage. Use a metal putty knife to scrape off any caked on dirt and grass, and spray the area lightly with silicone spray to help prevent future build-up. Check your mower blades and either replace them, or have them professionally sharpened. If you don't have one, pick up a spare blade to keep on hand, so you have something to use if your original blade becomes dull or damaged during the season. Store your mower in a dry environment. If your garage floor gets wet from snow and salt in the winter, consider parking your mower on top of a couple of 2 x 4's. Mower covers, if you use them, should be made from a breathable cloth material rather than plastic, which can trap water and cause corrosion. Stash a small box of mothballs near the engine to prevent rodents from nesting there. At the end of the grass-cutting season, drain both gasoline and oil from your lawn mower. Oil should be drained so that corrosive contaminants won't have all winter to damage internal parts. Evaporating gas will leave a hard, gummy scum in the carburetor and fuel lines and cause starting problems come spring. After draining the gas, run the engine to use up the dregs, then remove the spark plug & squirt a couple of shots of oil into the cylinder. Pull the starter cord a few times to distribute the oil inside the cylinder, and reinstall the plug. Finally, drain the oil out of the crankcase. How do I drain oil from a gas powered lawn mower?